Warned of an imminent nuclear attack on Los Angeles, a young man searches for the woman he's recently become romantically involved with. Some filmmakers don't get the careers their talent deserves. Cinephiles love to imagine the masterpieces the likes of Charles Laughton, Herk Harvey and Barbara Loden might have foisted on audiences had they followed up their sole directorial outings. Steve De Jarnatt went one movie further than the aforementioned trio of one-and-dones, before deciding Hollywood wasn't for him (and given recent revelations, that's probably a testament to his character). In 1987 De Jarnatt directed the blackly comic Melanie Griffith sci-fi vehicle Cherry 2000, which failed to connect with an '80s audience but now plays as remarkably prescient, its influence seen in recently lauded films like Her and Blade Runner 2049. A year later, De Jarnatt made his second and final film, Miracle Mile, the script of which had languished on the infamous 'Black List' of unproduced screenplays since 1983. Miracle Mile is one of those commendably ambitious low budget features that disappeared in the '90s once the likes of Tarantino and Kevin Smith discovered audiences were happy to watch a movie shot in an abandoned warehouse or a convenience store. It's deceptively expansive, taking place around just a few blocks of the titular Los Angeles thoroughfare, and the gorgeous neon speckled cinematography of Theo van de Sande and throbbing synths of Tangerine Dream add acres of production value. A post Top Gun Anthony Edwards gets a rare leading role as jazz musician Harry, the sort of guy romantics call a hero and squares call a wastrel. In an adorably goofy opening sequence we see Harry's unconventional seduction and subsequent courtship of Julie (brat packer Mare Winningham), a waitress at a 24 hour diner. Harry agrees to pick up Julie when her shift ends at midnight, but a power cut in his apartment complex means his alarm fails to go off and Harry wakes up after 3am. Harry rushes to the diner, but Julie is long gone. When the payphone on the street outside rings, Harry answers, but it's not Julie, it's a frantic voice claiming to be calling from a nuclear missile silo, breaking the news that the US is set to launch nukes at an unnamed nation (yeah, it's Russia), and a subsequent retaliatory strike will hit LA in roughly 70 minutes. Harry initially thinks it's a prank call, but when the voice on the other end is silenced by gunfire, he's forced to take it seriously. After convincing the patrons of the diner (a wonderfully assembled group of 'I know that face from somewhere' character actors) of the imminent threat, Harry sets off to pick up Julie and return to the Mutual Insurance building, where a well connected yuppie (Denise Crosby) has arranged for a helicopter to pick up a group of her friends. Needless to say, things don't go so smoothly. 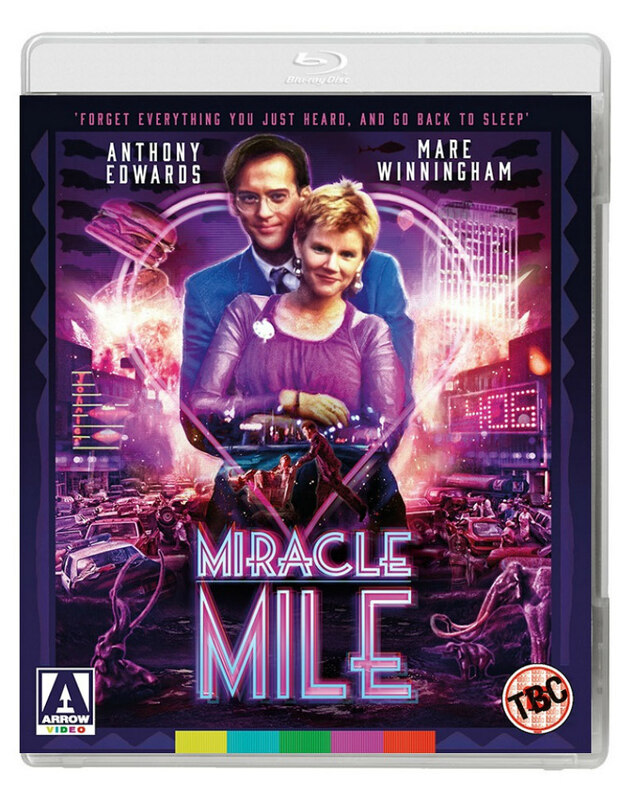 In an interview on Arrow Video's new blu-ray, Edwards talks of how he recently rewatched Miracle Mile and found it dated. I've never understood the use of 'dated' in a pejorative sense - if a movie from 1953 reflects the preoccupations and mood of 1953, what of it? I suspect what Edwards really meant to say was that Miracle Mile is old-fashioned. Even on its release in 1988 Miracle Mile would have felt old-fashioned. De Jarnatt's storytelling has more in common with studio productions of the '40s and '50s than an '80s indie feature. It relies a lot on coincidence, something which will have cynical modern viewers frowning and exclaiming "Oh come on, that wouldn't happen! ", and it's populated by larger than life 'movie' characters who behave as if they're in a '50s b-movie rather than an '80s thriller, reflected explicitly in the casting of mid-century sci-fi staple John Agar. Miracle Mile isn't a movie for cynics. It's unashamedly romantic, with Harry and Julie improbably falling for one another as quickly as those couples who meet in old adventure movies and agree to get married immediately after surviving the climax. But for all its outrageousness, it's a wonderfully human piece of cinema. If your heart doesn't glow at the scene in which a reunited, previously estranged elderly couple decide to spend their last hour on earth at their favourite diner, you should probably check for a pulse. It's also remarkably progressive for its era, with the most level-headed character coming in the form of a trans woman, and an openly gay man providing the closest the film has to a saviour figure. 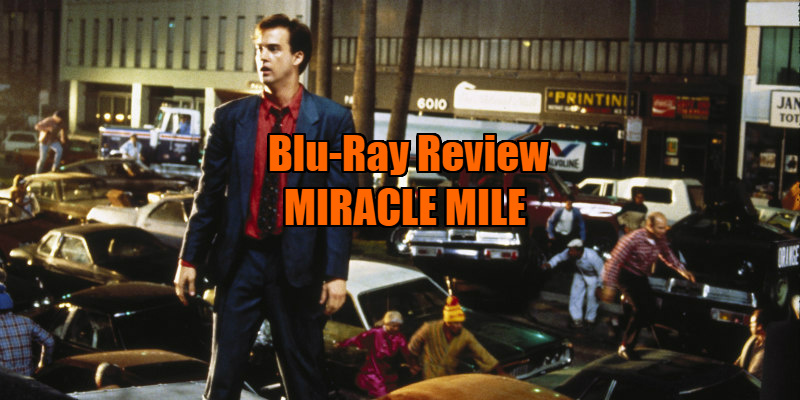 But most of all, Miracle Mile is a great piece of pulse-pounding entertainment. Harry's race against time to save the woman he loves (surely the inspiration for 2008's Cloverfield) is a nail-biting rush, our hero speeding incessantly around the same square mile of LA real estate like some possessed Nascar racer. Miracle Mile is a prime entry in a sub-genre I like to call the sidewalk movie. Sidewalk movies are like road movies, but their narratives span a limited journey in terms of mileage, and their protagonists are generally on foot. They were big in the '60s with films like The Swimmer and Mister Buddwing, and they experienced a comeback in the '80s with the likes of After Hours and Into the Night, movies which like De Jarnatt's, take place in the deserted late night streets of great American metropolises. Miracle Mile may not be the best sidewalk movie (for me, After Hours takes that title), but it's the most thrilling. And with the threat of nuclear engagement rearing its ugly head once again, like Cherry 2000, it's another Steve De Jarnatt movie that's become unfortunately prescient. Two commentaries - one with De Jarnatt, and another in which he's accompanied by cinematographer Van de Sande and production designer Chris Horner; video interviews with De Jarnatt, Winningham, Edwards and co-composer Paul Haslinger; a short story read by De Jarnatt; trailer; deleted scenes; outtakes; and a booklet with new writing by the great Tim Lucas. Miracle Mile is released on dual format blu-ray/DVD by Arrow Video on October 16th.